The Islamic Society of North America (ISNA) has rebuked anti-Semitic comments by a speaker at the group's national convention July 4th weekend. "Hezbollah still serves a role. I think that Lebanon is still under constant threat from its southern neighbor. And I see nothing wrong, as long as Hezbollah abides by certain rules and regulations; I see no reason why Hezbollah should not remain armed." 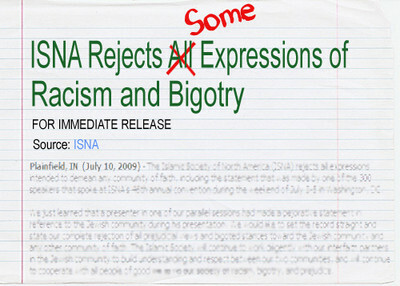 Yet ISNA's statement takes no responsibility for his presence or the totality of his message. For another critique, see this from Daniel Pipes. Listen to Umar's comments at the ISNA convention here, here, here and here.